In going back through the blog (I can't believe we're going into our sixth year!) I am a little surprised I have never posted about one of the most beautiful services in the Orthodox Church - Forgiveness Vespers. 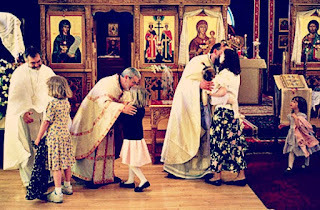 Falling on Cheesefare Sunday (the day we stop eating dairy products until Pascha), also known as Forgiveness Sunday, the Church holds a Vespers service in the afternoon following the Divine Liturgy. The service is intended to usher in Great Lent, and draw the Church into a season of repentance, fasting, prayer and almsgiving. It begins as a normal Vespers service, but during the Prokeimenon, the paraments are changed from gold to purple, the lights are dimmed, and Lent begins. The service then takes on a more penitential tone. However, the real beauty comes at the end of the service. The choir sings the Paschal Canon, foreshadowing the feast to come, and culminating in the Paschal hymn "Christ is risen from the dead, trampling down death by death, and upon those in the tombs bestowing life!" As this hymn is sung, each parishioner goes around the parish one-by-one greeting every other parishioner with the petition "forgive me, a sinner." Each parishioner then responds "God forgives" and repeats the petition to the first. This means that by the time Forgiveness Vespers is over, each member of the congregation has both asked for and received forgiveness from every other member of the congregation. As it is customary to go to confession prior to the start of Great Lent, this means that each and every parishioner has been expressly forgiven by God and each and every other parishioner prior to the start of this penitential season, which is why tomorrow is called "Clean Monday." So it is that the request for forgiveness is answered not merely with "I forgive you," but with "God forgives," a hearkening to the Lord's prayer, "forgive us our trespasses, as we forgive those who trespass against us." We remind ourselves and each other that we hold nothing against the other, because God forgives us. As the Scripture says, "we love because He first loved us." As best I can tell, this is a ritual unique to the Orthodox Church. When we feast, we feast, and when we fast, we fast, and Lent begins with the ultimate fast, as we start Great Lent by fasting from holding our sins against each other. We forgive, freely, as God forgives, freely. And in so doing, we love, freely, as God loves, freely.